Pantheon. Hardcover. VERY GOOD. Light rubbing wear to cover, spine and page edges. Very minimal writing or notations in margins not affecting the text. Possible clean ex-library copy, with their stickers and or stamp(s). Knopf Doubleday Publishing Group, 1996. Hardcover. Good. Disclaimer:A copy that has been read, but remains in clean condition. All pages are intact, and the cover is intact. The spine may show signs of wear. Pages can include limited notes and highlighting, and the copy can include previous owner inscriptions. An ex-library book and may have standard library stamps and/or stickers. At ThriftBooks, our motto is: Read More, Spend Less.Dust jacket quality is not guaranteed. Knopf Doubleday Publishing Group, 1996. Hardcover. Good. Disclaimer:A copy that has been read, but remains in clean condition. All pages are intact, and the cover is intact. The spine may show signs of wear. Pages can include limited notes and highlighting, and the copy can include previous owner inscriptions. At ThriftBooks, our motto is: Read More, Spend Less.Dust jacket quality is not guaranteed. Pantheon. Used - Like New. Ships from Reno, NV. Book in almost Brand New condition. 100% Money Back Guarantee. Shipped to over one million happy customers. Your purchase benefits world literacy! Pantheon Books, 01/01/1996. Hardcover. Used; Good. **WE SHIP WITHIN 24 HRS FROM LONDON, UK, 98% OF OUR ORDERS ARE RECEIVED WITHIN 7-10 DAYS. We believe you will be completely satisfied with our quick and reliable service. All orders are dispatched as swiftly as possible! Buy with confidence! NY: Pantheon. Near Fine/VG+. 1996. 1st. hardcover. 8vo . 325pp . Printed mylar wrapper, so can't put a brodart on this one. Bit of rubbing to dj. .
New York: Pantheon Books. Nearly fine copy in printed acetate dust jacket. 1996. 1st. hardcover. 8vo, 325 pp. .
NY: Pantheon, 1996 Book has small red remainder dot on top paper edges, photo b&w covers have picture of Cohen. 325pp. Stated 1st Ed. with complete number line. Square, tight, bright copy with firm corners. No internal names, notes or marks. Photo illus. in b&w. DJ is a heavy clear plastic ($26.00). USPS Tracking provided. H. First Edition. Cloth. Almost Fine/Fine. Illus. by Photo Illus. In b&w. 8vo - over 7¾" - 9¾" tall. Music. U.S.A.: Pantheon. 1996. F First Edition Used. H Hardcover. Near Fine. In printed mylar jacket over pictorial boards, 8vo, 325pp. Illustrated. New York: Pantheon Books. Fine copy in printed acetate dust jacket. 1996. 1st. hardcover. 8vo, 325 pp. . VARIOUS POSITIONS, A Life of Leonard Cohen. NY: Pantheon, 1996. (CAD) First printing. Remainder dot to top edge of pages, no other markings, otherwise Fine in about Fine clear acetate Dj with slight rubbing to surfaces. Gossy photo boards with clear acetate Dj, 325pp, index. B&W photos. This is a mid 1990s biography of the Canadian poet and songwriter. (2.0 JM FO 16/a6. 1st. Hardcover. Fine/Near Fine. 8vo - over 7¾" - 9¾" tall. Remainder. NY: PANTHEON BOOKS, 1996. CLEAN COPY.. FIRST EDITION. HARDCOVER. VG/VG. Nadel, Ira Bruce;Nadel, Ira B. New York, New York, U.S.A.: Pantheon Books, 1996. Book. Fine (Book Condition). Hardcover. An excellent copy, but with shelfwear to acetate dust jacket. Text clean, binding strong. [Our rating system: 1. Fine; 2. Near Fine; 3. Very Good; 4. Good; 5. Fair.]. Pantheon. As New in Fine+ dust jacket. 1996. First Edition; First Printing. Hardcover, photos. 0679442359 . Book is New. No notes, names or ANY markings. NOT remaindered. DJ not price clipped ($26) with SLIGHT rubbing to acetate DJ. ; 325 pages . Pantheon Books, 1996. 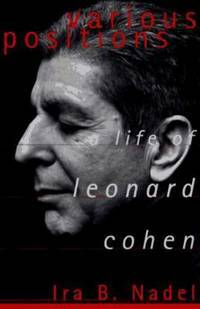 (1st edition, 1st printing) Large, heavy book, smooth black covers with close-up photo portrait of Cohen on front and back, 325 pages including a glossy photo section. DJ is clear plastic with orange border at bottom edges, orange and gray lettering--unique! DJ and book, both As New.. First Edition. Hard Cover. As New/As New. Pantheon. Hardcover. 0679442359 Like New Condition. . Fine.